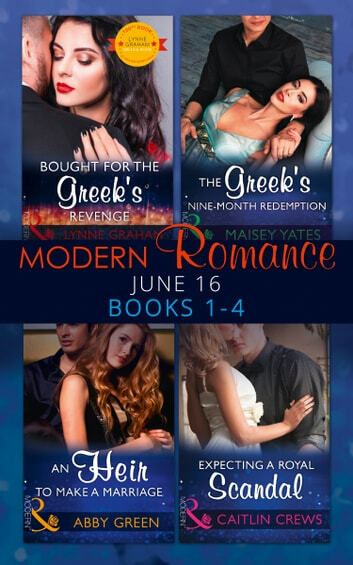 Bought for the Greek’s Revenge Ella Palmer has neither the money nor the connections to warrant the interest of Nikolai Drakos’s arch enemy. Yet the unassuming beauty has done just that—and claiming her will be Nikolai’s ultimate satisfaction! The ruthless tycoon will use any means necessary to ensure Ella’s compliance, so he buys out her family’s debts. Debts he’ll forget if Ella becomes his mistress. But when he discovers the true extent of her innocence Nikolai is forced to consider something new: it appears the indomitable Greek is about to take a bride! An Heir to Make a Marriage In desperation to save her father, housekeeper Rose O’Malley thinks she can trap a man. But the second she faces Zac Valenti and the force of his palpable sensuality, she knows she can’t go through with it! Before she can call off her deception, Manhattan’s most eligible bachelor sweeps Rose off her feet – and into his bed! Stealing away like a guilty Cinderella, Rose vows never to see Zac again…until she discovers she’s pregnant and Zac demands his passionate betrayer and his baby remain under his control! The Greek’s Nine Month Redemption Fury is all Elle St James feels when she looks at the man she once thought of as family. Apollo Savas has mercilessly destroyed her father’s company but she holds the last little piece! Elle is determined to stop the step-brother who is both sensual fantasy and darkest enemy. But their forbidden desire gives way for one illicit night that leaves untouched Elle with a life-changing consequence. Now irrevocably bound to Apollo, will nine-months be long enough for Elle to redeem this brooding Greek? Expecting a Royal Scandal Royal scoundrel Felipe Cairo is the least likely king in Europe and avoids the crown with a passion! To uphold his reckless image and avoid the shackles of duty, Cairo must choose a most inappropriate wife… Media sensation Brittany Hollis has a reputation outrageous enough to rival Cairo’s. Yet with each scorching kiss, she reveals more of her secrets than she’s ever shown the world. But there’s a twist in their tabloid fairy-tale that shocks them both…Brittany might not be queen material but she’s carrying a royal heir!